In the Beginning is the first of a three-part series on the experiences of navigating the start up and managment of a small design biz through the worst recession since the Great Depression. I founded SPACE March 23, 2005, the morning after I got fired. Actually, I think it might have even been the evening of the same day. The reasons for my firing are less important than my response to what I determined would be not a setback, but an opportunity. However, in that moment, I found myself with no business plan, no experience running a company, no money, and perhaps most importantly, no income. One thing I did have was a loyal following of clients, and that is a “must have” to get things rolling. 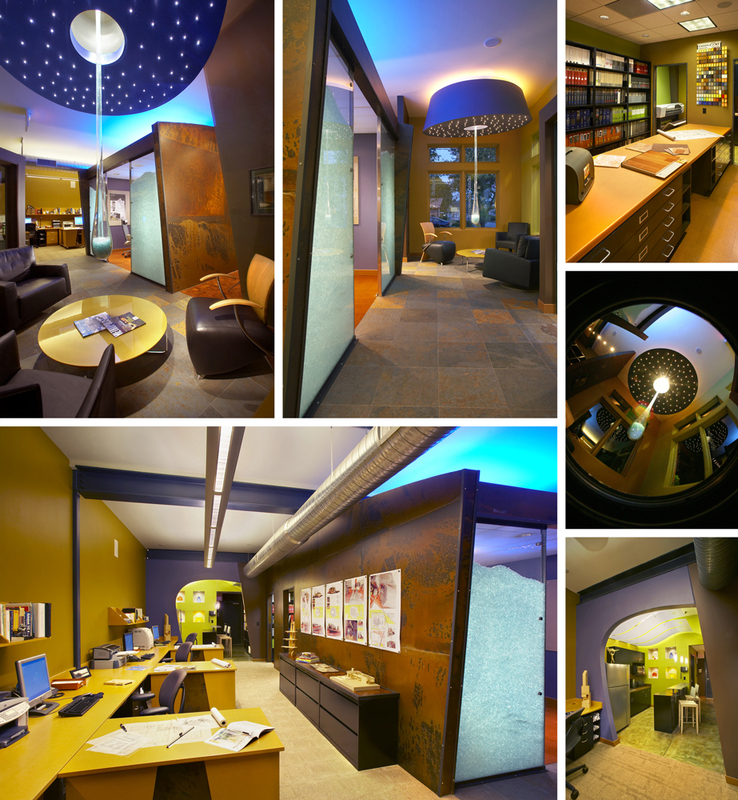 ICON Contracting offices, which I designed just prior to founding SPACE. In 2005, times were much better for architects. Most firms were busy, and if you provided a good value, the work was there. ICON Contracting, who I had worked with on numerous projects, offered to share their offices on Sutton Avenue in Maplewood with me while I got things together. In just a few months, there was enough work for me to hire a couple of employees, including a colleague I had worked with for years, Derek Maschek. They were set up in a makeshift office in the copy room on folding tables. We planned our new offices to be built in the empty tenant space on the first floor of the same building. This is what our first studio in Maplewood. Built out to fit five people! I have always believed it is important that the architect’s office should reflect what they preach: Inspiring work space improved company culture. SPACE got out of the gate quickly, growing from just me in 2005 to twelve people by late 2007. In the twenty plus years working at various design firms around the St. Louis, I had built a great network of designer friends, which was helpful in finding the right blend of talent. From the beginning, I wanted to have a firm that did not revolve around me as designer/architect, but a team of the finest talent and best people I could find. Although that may sound like an obvious thing to do, often design firms are built around the Principal(s), which is quite different. People are not necessarily hired for their design expertise, they are hired to develop and produce the Principal’s design. Part of the reason the firm isn’t named Niemeier Design is because I wanted to be able to attract top talent, who may be opposed to the idea of working “under” another architect’s name. SPACE would be made up of multi-talented, creative people who would work collaboratively, learn from each other, and leave a legacy of great design work. My objective for SPACE is always to find people more talented than I am, or skilled in ways that I am not, as long as they fit within our culture. The culture of SPACE is different from many offices: no titles, no private offices, no set hours, and no segregated departments. Big egos, negativity, non-collaborators, and divisive people are usually naturally purged, and we have very little turnover. We try to implement a culture that is based on trust and equality. Basically, hire the best talent, treat them with respect, give them some freedom and get out of the way. It seemed to me a very simple and common sense way to build a company, but none of the previous firms where I had worked had done anything remotely similar. 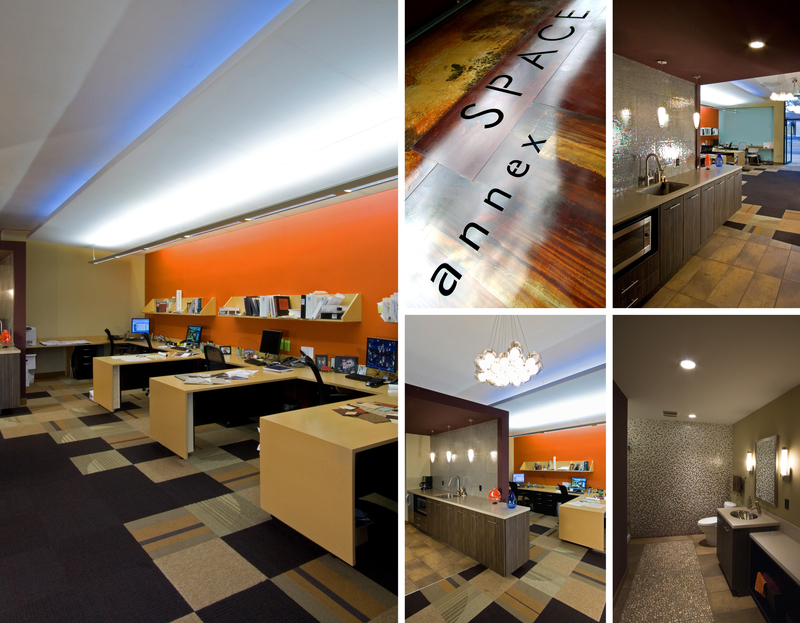 SPACE has enjoyed a lot of success, winning prestigious and elusive AIA design awards 4 years in a row. We’ve received some great press as well, including really great feature stories in St. Louis Magazine in 2005 and a KMOV news feature in 2008. It seemed like starting and operating a design firm was easy, and we were having a great time. The talented group of people that I worked with daily were (and are) not only valued team members, but also friends. Our Annex office in Maplewood, across the street from our main office. It was easy to be bullish on our future. We had expanded into another tenant space across the street, opened up a fabrication shop, and at the end of 2007, started up a construction company, SPACE Constructors. The sky was truly the limit, but we soon learned that the sky was falling. Ironically, we were having our best year ever in 2008. Both our design and construction companies had full pipelines of work and employees were busy. Despite the robust activity in the office, the collapse of the housing and financial markets foreshadowed trouble to come. We had just won three substantial projects in October, but when things started to go sideways, all three projects disappeared quietly. The phone stopped ringing, and I mean that quite literally, the phone did not ring for hours, then days. In the design field, you experience an ebb and flow to the work cycle, sometimes even “feast or famine”, and you learn to not panic when things slow down. Then we started hearing about bigger firms letting people go in droves, the few calls we did get were from newly unemployed architects and designers looking for work. In retrospect, it was definitely time to panic. Good post, plus you leave us hanging at the end wondering if your phone starts ringing again. I always like a cliffhanger. Thanks Laura! And thanks for tuning in to the Blog. It’s kinda fun to not be limited to 140 characters. Regarding the cliffhanger ending, at least you know we didn’t die! Next one will be getting thru the recession, so kinda rough, but at least there is a part three! Thanks for sharing your history and story. I am alway fascinated with how people get where they are, no matter what the occupation or profession This profession though of course I have a huge interest.